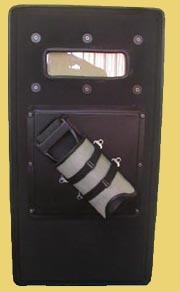 The EDU shield has been developed for use by explosive disposal and tactical teams. Years of research and attention to detail have produced shield systems that combine high protective capability and superb manoeuvrability. The EDU shield is now in use in many countries throughout the world. Developed to offer maximum over pressure and fragmentation protection during explosive disposal operations. The EDU is equipped with removable spring-loaded legs. In the stowed position, the legs hug the edge of the shield for easy storage and manoeuvrability. One easy motion releases the support legs into the deployed position, allowing the shield to be self-supporting. Materials: The shield is constructed of a multiple layer compression moulded Kevlar composite laminate. Ballistic visor is made of Lexan. Ballistic Protection: V-50 rating using NATO STANAG 2920 test specifications. Shield only: 555m/s; Shield with cover: 630m/s. Ballistic protection rating against firearms available on request. Overpressure Protection: Offers superior protection against blast overpressure, results available upon request. Impact Attenuation: Forehead and forearm impact attenuating ethafoam pads are built into the inside surface of the shields. These are designed to absorb shock from fragment/bullet and pressure wave impacts. Outer Cover: The optional add-on cover is composed of Kevlar enclosed in a tough nylon sleeve. Backed by the basic shield, it is designed to boost ballistic and fragment capture capabilities. Handles: The shield includes interchangeable handles (hand and forearm) to facilitate left or right handed approaches, or a vertical mounted strap and foldaway handle system. Other handle configurations are available. Colour: Standard matt black (custom colours available on request).